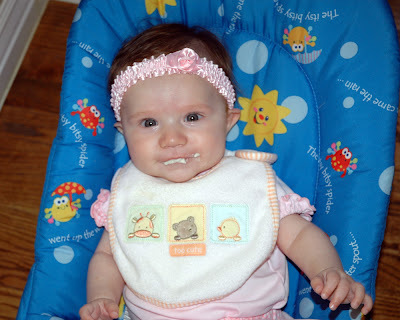 Ava has been eating solid foods now for the last few weeks. We started her on rice cereal. At first she wasn't quite sure what to do with it, getting more on her face than in her belly. However, by about the third time around she had it all figured out. 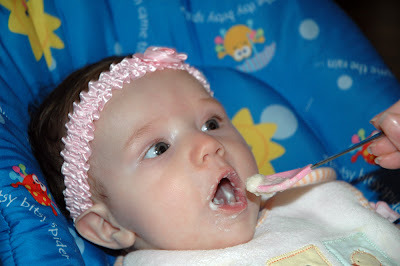 She now opens her mouth like a perfect little bird when she sees the spoon approaching. In fact, the etymology for Ava is "bird-like," derived from aves, the Latin word for bird. When we feed her she gets extremely excited. 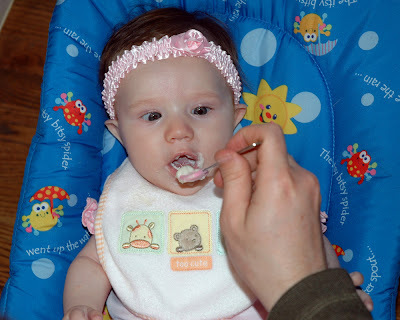 Her eyes get wide and her hands shake with anticipation as each spoon-full of baby food moves toward her gaping mouth. Once she finishes, she is quite the happy little camper. Now if we could just get her to feel the same way about sleeping as she does about eating. Here is a rare picture of her happy in her crib. She is looking intently at her mobile. Feeding time is the best! She is precious! Nissa can't wait for a play date.